Continuing on with my series on the Governors of Illinois down to the end of Reconstruction, we come to the fifth Governor of the State, William Lee D. Ewing. 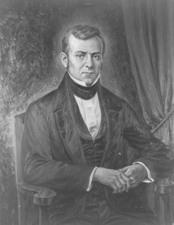 Born in Paris, Kentucky on August 31, 1795, he practiced law in Shawneetown, Illinois. James Madison appointed him a land office receiver in Vandalia in 1820. During the BlackHawk War he served as Colonel of the Spy Battalion, a scouting unit. Abraham Lincoln served for a time in that unit. In 1830 he was elected to the Illinois House of Representatives as a Democrat, previously having served as clerk of the House, and was immediately chosen as Speaker. In 1832 he was elected to the State Senate and served as President Pro Tempore of that body. In 1833 he was chosen as acting Lieutenant Governor of the state. In 1834 upon the resignation of Governor Reynolds to take a seat in Congress, Ewing became Governor. He served for two weeks until the newly elected governor could be sworn in. This is the shortest gubernatorial term in the history of Illinois, and no doubt the most inconsequential. Upon the death of Senator Elias Kane, Ewing was chosen to fill out his term. He was unsuccessful in winning election to the Senate after Kane’s term expired, and won election to the Illinois House later, serving once again as Speaker. He died on March 25, 1846.